I was just eyeing the last two of Davies’ novels this morning, thinking that seasonally it would be a good time to close that gap. It does seem quite an oversight to not have had one of his books appear on the program yet. 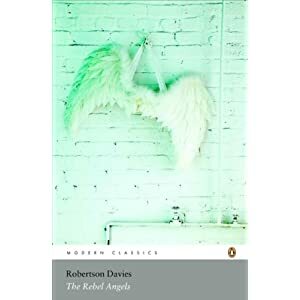 I remember taking tonnes of notes when I read The Rebel Angels but I didn’t count it a favourite at the time (the oft-assigned Fifth Business had my vote). All interesting ideas! I have to agree with Fifth Business, but you make a good case for revisiting The Rebel Angels. I loved it at the time but haven’t read it again since.